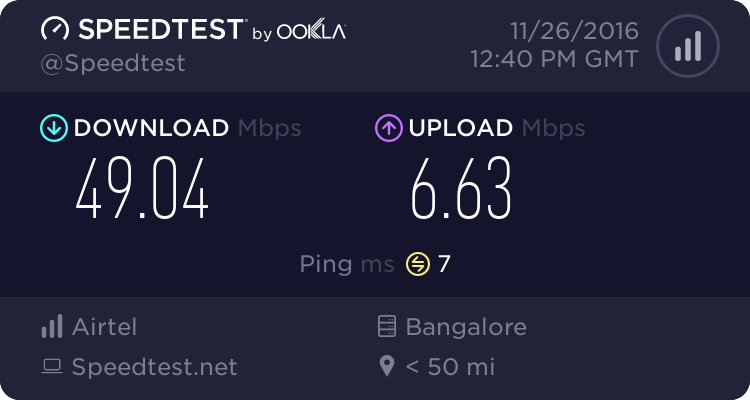 I let the speed test image do all the talking..
Visit Airtel V-Fiber site & provide your details. They would call you back for upgrade. Just the modem. They will replace old A-DSL modem with the newer model. No change in the wiring at-all. The newer modem has built-in Wi-Fi as well. Remember, you also need to get new A-DSL splitter. Airtel does not provide the same. Airtel charges 1,000 Rs for the modem. Airtel charges this to your monthly bill via 5 monthly installments (200 Rs each moth). Also the new splitter costs about 280 Rs. What about the monthly plan? No changes in your monthly broadband plan. My current plan is 1399 Rs for 100GB.